Our last of the “I Am” statements of Jesus draws into the most important moment in human history – The resurrection of Jesus Christ! We stand amazed on this day as we realize that the empty promises of Jesus Christ are all made fact at the moment of resurrection because he proved who he was. In John 11, Jesus is dealing with the death of a close friend and he turns the whole idea of death upside down by telling Martha, “I Am the resurrection and the life” and then proving it by raising Lazarus from the dead! It is so important to the see the problem, the purpose, the promise, and the proof that emerges through this scripture. You will be “surprised” by how this will change your perspective about death and about the fear that comes with it. Join this Easter Sunday as we celebrate the risen Christ! Did you know there are “empty promises” in scipture? 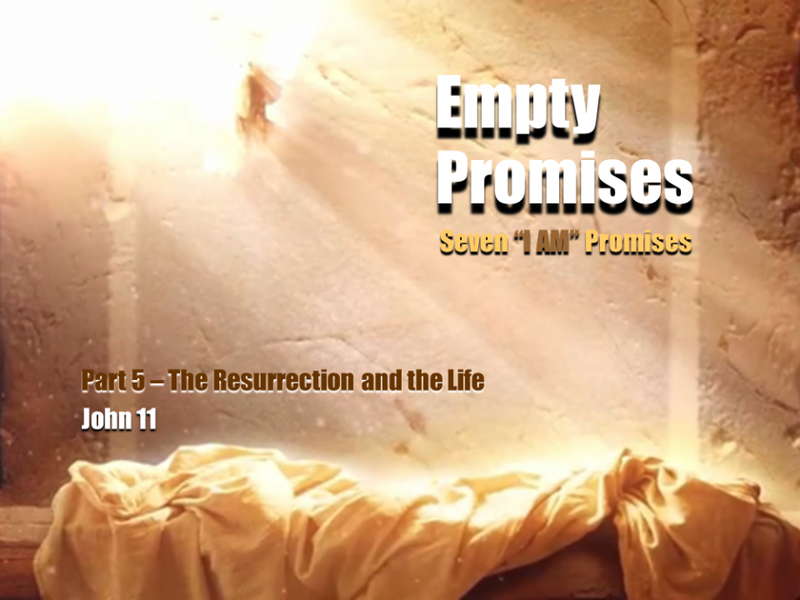 Yes, they are empty until the resurrection – then the empty tomb reveals that they are true! Over the next five weeks, we will be looking at what the “I Am” references in the book of John reveal about Christ as the Son of God and our messiah! The resurrection proves what Jesus says and what has been said throughout the Old Testament about the coming Christ who would be God in the flesh. As Easter draws near, let us rejoice as the Holy Spirit brings us to the point of understanding the amazing connection between the “I Am”‘s of Jesus and the Resurrection.